The main draw for the 2017 Aegon International in Eastbourne was conducted on Saturday and first round action will commence on Sunday. I know this draw is going to be a cracker but a lot is still unknown with all 16 seeds getting byes into the second round and the qualifiers yet to be placed. I’ll also be surprised if there are no withdrawals! Read on for my three matches of the day that I plan to watch live on Sunday. Both players have been within the world’s top ten in the past two years but currently find themselves outside of the world’s top 25. Suárez Navarro leads the head-to-head, 5-2 and has won their last three meetings. However, Makarova is the bigger threat on grass and of course, we are in the presence of the Bourne-GOAT! 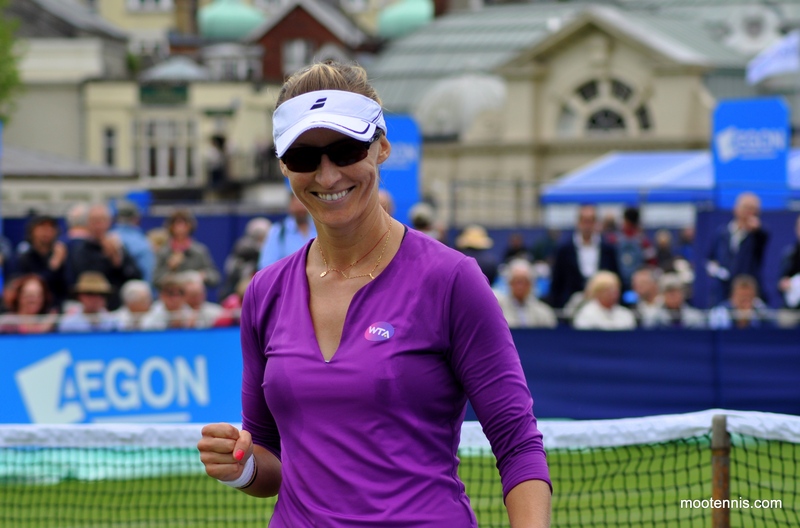 Makarova has reached the quarter-finals of Eastbourne on seven occasions including winning the title as a qualifier back in 2010. While this will be Makarova’s first match on grass, i’d still give her the edge in this match-up on this surface. I remember being excited about this match-up two years ago but ended up missing the match. The pair played each other in the first round of Eastbourne back in 2015 – Riske won that match, 6-0 6-3. In fact, Riske has never lost to Cornet in three previous meetings. Riske on grass is a wonderful thing although she’s yet to win back-to-back matches on grass in 2017. Still, the American will be the clear favourite based on surface preference and head-to-head record. This might be the ultimate contrast in styles between the ultra-aggressive, Lucic-Baroni and the slicing and dicing, Niculescu… oh this could be a joy to watch! Niculescu won their only previous match in Cincy qualifying in 2011, 7-5 6-0. Both have been struggling of late – after a stunning start to the year, Lucic-Baroni’s progress has been halted by injury with just two match wins since Charleston and this being her first match on the grass. Niculescu is enjoying a torrid year, something that has kind of gone under the radar. I wonder if Niculescu is struggling with injury this year? The Romanian player has lost 11 of her last 12 matches and hasn’t won since Indian Wells. A tough one to call if both are not healthy. Assuming both are, i’d say Lucic-Baroni’s confidence from the 2017 season to be a factor. Ana Konjuh and Yulia Putintseva both open their accounts last up against qualifiers. There will be home interest on Centre Court when Heather Watson takes on Lesia Tsurenko, while Timea Babos and Elise Mertens will both be seeking their first wins on grass this year when the play each other, third up on Court 1. Finally, i’m also hoping to catch the doubles duo of Timea Bacsinszky and Svetlana Kuznetsova in action, which sounds like fun! The predictions here will be a mess again. Tsurenko has better form and will beat Watson (slump form) and Niculescu will beat Baroni also. CSN and Makarova is a 50/50 match. Mallorca– Picking Goerges over Sevastova as Goerges has destroyed the competition this week. The bookmakers have this as even. Birmingham–The bookmakers have Kvitova as a big favorite over Barty. Barty has had a great week but I can’t see her beating a surprisingly inform Kvitova. Barty has moved up 23 positions in the WTA rankings. Agree with you on both counts. Love the Birmingham final, can’t go wrong with Petra and Ash! I think you underestimate how much potential Ashleigh Barty has, personally. cant win against lucic baroni, cant win with lucic baroni. annoying person to stay away from forever. Big lizards in Miami big birds in Eastbourne— Its an all out attack on the tennis girls!!! You should see the seagulls we have in Liverpool! Theyre absolutely vicious and will take food right out of your mouth.